When Is a Cold Sore No Longer Contagious? Influenza is a highly contagious respiratory illness. According to the Centers for Disease Control and Prevention, every year between 5 and 20 percent of people in the United States get the flu. More than 200,000 are hospitalized due to flu-related complications and nearly 36,000 die from causes related to the virus. The incubation period is about one to four days. According to the CDC, although the incubation period can range from one to four days, the typical incubation period is two days. People can begin infecting others about one day before any symptoms of the virus appear, and are contagious for about a week after that. Signs of the flu include high fever, headache, extreme fatigue, sore throat, coughing, muscle aches and pains, and sometimes a runny or stuffy nose. The flu is caused by a virus. It's often spread by an infected person coughing or sneezing near someone else, who then comes into contact with tiny infected droplets. The virus can also be spread if someone touches his nose or mouth after coming in contact with the influenza virus. 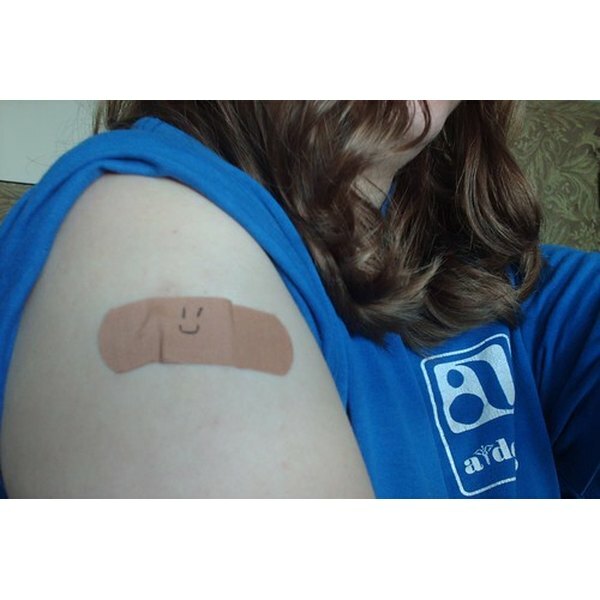 The flu vaccine greatly reduces the risk of catching the flu. There are two ways it is administered: an injection, which contains the dead virus; or a nasal spray, which contains the live virus in a weakened form. The CDC notes that flu season can begin as early as October but usually peaks during February. Christie Johnson is a 10-year television news veteran. She has covered everything from political debates to hurricanes to health issues. Johnson left the news business to become a fulltime stay-at-home mother and part time freelance writer.